Last week I needed a quick little gift for a friend's birthday so I came up with this sweet box. It holds a packet of 3 ferrero rocher chocolates perfectly. I am thinking it would make lovely little table favours - I might need to recreate these for Easter! A quick change of colours, papers and sentiment and these would suit any occasion. I used Sweet Sugarplum cardstock and a piece of the Sweet Soiree designer series paper. 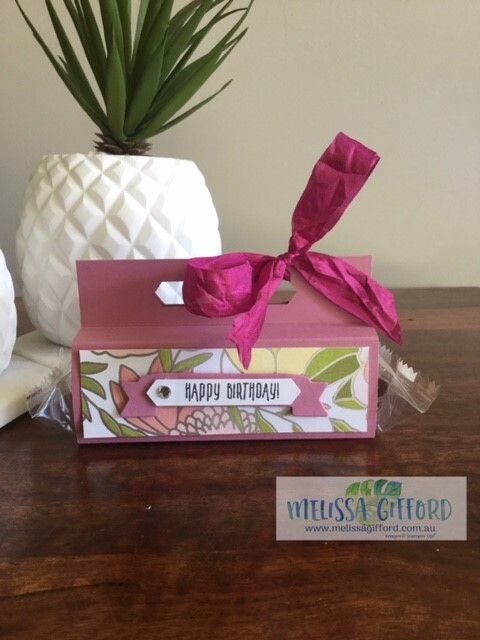 The Happy Birthday sentiment fits perfectly into the classic label punch and a little bit of bling just finishes it off. Watch the youtube clip below for the dimensions of the box.